Apart from the annual Geminid Meteor shower and comet Catalina, there is also Santa’s sleigh on Christmas Eve, which will in fact be the International Space Station orbiting 250 miles directly above the UK. But telling your kids it’s Santa Claus hurrying to get the last presents delivered might help get them into the festive mood. December is a great month for stargazers. All you have to do is wrap up warm and look up at the sky. Comet Catalina is running about a magnitude fainter that had been predicted, says Sky & Telescope, now that it is coming into view low in the east during dawn. Alan MacRobert says its on track to glow at 6th magnitude at it climbs higher into the predawn eastern sky during December and January. If you have a pair of binoculars or a small telescope, you should have no trouble seeing the comet. Look within the constellation of Virgo during the early hours, just before the sun comes up. In November, comet Catalina made a quick turn around the Sun and is coming rapidly towards us. 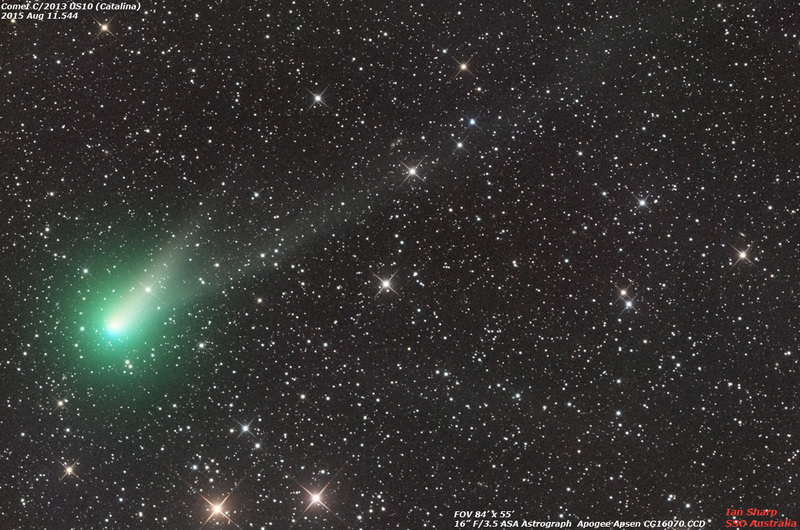 Comet Catalina, also known as C/2013 US10, was discovered on October 31st, 2013, by the Catalina Sky Survey. It has come into our neighbourhood from the Oort cloud, an extended shell of icy objects that exist in the outermost reaches of the solar system up to 100,000 AU from the Sun. One AU is the distance from Earth to the Sun once. Scientists believe the comet is visiting the inner solar system for the first time, given its orbital period was determined to be many millions of years. The annual Geminid Meteor Shower will be upon us soon as Earth passes through a trail of debris left by an asteroid called 3200 Phaethon. Most celestial showers come from comets, but not Geminid (from an asteroid). The Geminids are super. NASA says that up to 120 meteors streak across the sky every hour at their peak (UK’s Met Office says just 50). The shower is reliable too, coming as regular as clockwork. When it is time, just look up at the sky. You don’t have to worry about locating the Gemini constellation to catch the show. Even though the meteors begin at the constellation, they will streak brightly across the whole sky. All you will need are a pair of eyes, hot drinks, a clear sky and some warm clothes. This year, the Geminids will peak during daylight on 14th December across the United States, says NASA. However, you will still get some decent meteor rates the night before and after, beginning at 9 to 10 pm. As the International Space Station (ISS) whizzes around the Earth, its huge solar panels catch the Sun’s rays, making it shine brightly in the sky. On Christmas Eve, British adults could easily mistake it for Santa’s sleigh, couldn’t we? VirtualAstro, who often publishes the space station’s positions over Earth, says it will be directly above Britain on Christmas Eve, rising in the west at 4.42 pm and setting in the south at 4.50pm. While young kids may enjoy the thrill of seeing Santa doing his Xmas duty, older kids will have an opportunity to learn about astronomy, space travel and the ISS.